This item has been discontinued. 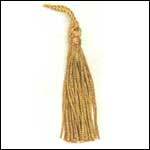 It's a 3" acetate and cotton chainette tassel with a 1 1/2" loop from our Princess 1 Collection. I only have black and chinese red still in stock. If there are other colors you are interested in please let us know because we may be able to get you packs of 36 per color still until the stock runs out.